Holley Gerth over at holleygerth.com has asked us this week “What Brings You Joy?” That’s what she wants to talk about today on Coffee For Your Heart. Let me tell you what just fills my heart up to the brim with joy. It’s music. It’s singing, it’s playing, it’s listening to music. It’s anything played on a fiddle. It’s pretty much anything with a country twang. You know, they say there are studies that listening to music does fantastic things for our health. I forget where I read that, so I can’t cite it… whoops. But I was reading that listening to music releases endorphins and gives the illusion of happiness that may not otherwise have been there. That’s my paraphrase. I personally will take it one step farther and assert that for me, music gives more than the illusion of happiness. Music makes me joyful. I have God-given talent in music. I won’t argue that. I can play both the piano and the violin by ear. I taught myself to play the harmonica so that I could teach it to Grade 6-8 students who just really didn’t want to play the Recorder for another year. I can sing a (low) soprano, alto, or tenor part when singing with other people. I love my vocal range, and I thank God for it all the time, because I have a lot of fun with it. I use my musical talent to give back to God, and I feel like that makes a huge difference in why it makes me more than happy. 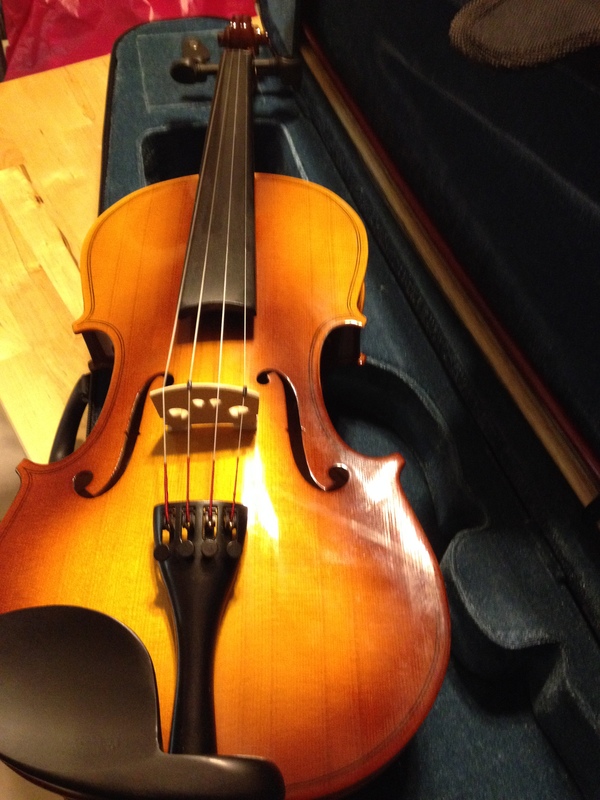 I’ve learned to play the violin (am learning) for two reasons — so that I can fiddle, but also so that I can play on the Worship team at my church. I haven’t made it to that level yet, but I’m getting there. This weekend, I played with a group of people for the first time in my life. Pretty much in tune, and all by ear. My Mom asked me to sing with the team, but since I’d just been sick, I declined. She said, “well you brought your violin, right?” On Saturday afternoon, my Mom and I worked through the music she gave me, a couple of the songs being unfamiliar to me. I played off of guitar chords, which, on a violin, means I played pretty much by ear. Now, I’m starting to feel a little bit like I’m bragging, so I’ll stop talking myself up and start talking God up instead. I felt so incredibly privileged to be able to participate in Worship in a completely new way this weekend. I’ve never played an instrument in front of 75 people before. I’ve only used my voice. And let me tell you, my heart has never meant it as much as when it was a bow across a set of strings… not while I was helping lead. I find that normally, while I’m singing on a worship team, it’s a fight for me to pay attention to the reason that I’m singing rather than the mechanics and the act of singing. Is my part right? Am I flat? Where do I come in? On Sunday, when I played with the Worship team, I messed up all over the place, but I made those strings sing for Jesus, and it was the best feeling I’ve experienced in a long time. Following our Sunday morning service, I got a chance to play some fiddle with our guitar player and our drummer, and my heart just soared. Even when it makes me seat dance in the car and look like a fool at stop lights… I’m joyful. My heart is full of joy.